The Sunday Times named Bristol the best place to live in Britain in 2017. Indeed, a trip to the south of the city in the August sunshine of 2016 was quite pleasant, despite Gary Caldwell’s team going down in the 90th minute. Latics will be back to Ashton Gate next season, this time with memories of a difficult night in the north of Bristol at the rustic Memorial Ground. The Memorial Ground was named in honour of rugby union players who died in the First World War. It hosted rugby from 1921 until Bristol RUFC moved to Ashton Gate in 2014. Bristol Rovers moved there in 1996 and, despite efforts to build a purpose-built stadium elsewhere, remain rooted at the old stadium. Arriving there last night in torrential rain I asked a steward how to find my seat, being told that it was under the canopy around the corner. The term “temporary stand” did not fully depict that canopy. It was a difficult night for spectators and Wigan Athletic players alike. Rovers adapted extremely well to the terrible conditions and posed an attacking threat from the onset. Latics had their fair share of the ball in the first half, but there was no penetration to their attacks and James Vaughan was a truly “lone” striker. There had been talk among Latics fans prior to the game about players being out on the town at the weekend, celebrating the promotion sealed at Fleetwood. Indeed, many of us wondered if the team would be at its best, given what had happened. Those fears proved to have some foundation. Paul Cook had let us know beforehand that he would be making changes in his line-up, that Michael Jacobs would be back after being rested at the weekend. “Crackers” did return in place of Ryan Colclough, with James Vaughan replacing Will Grigg, but Cook once more resisted a more significant freshening-up of the team. For most of the game a “washed out” Latics were outplayed by a Rovers team who moved the ball round well in the appalling conditions, the Memorial Ground pitch somehow holding up despite the quantities of water pouring down on it. Rovers opened the scoring in the 28th minute as Liam Sercombe’s low shot beat Christian Walton. It was not the first time we had seen the big keeper beaten by a shot like that, but to his great credit the young Cornishman went on to be Wigan’s Man of the Match, making a series of excellent saves to keep his side in the game. The 6 ft 5 in Walton will surely need to keep working on getting down to low shots, but the rest of his all-round play has been excellent throughout the season. So often when Latics have not been firing on all cylinders the lack of impact of the wingers has been particularly noticeable. Last night neither Jacobs not Massey were able to get past their markers, with the latter being called off after 67 minutes for Colclough. The simultaneous introduction of Will Grigg for Vaughan was no surprise. Many of us were hoping for a change in tactical shape, but it remained 4-2-3-1. With Rovers continuing to threaten, Latics somehow managed not to concede another goal and on the 76th minute mark Cook finally bit the bullet and brought on Devante Cole for an ineffective Gary Roberts. The introduction of a second striker made an immediate difference, energising the Wigan attack. Cole was soon to put the ball in the back of the net, controversially being called offside by the linesman. But Colclough’s long-range drive was fluffed by home keeper Slocombe after 80 minutes and Latics went on to claim a point, although Rovers hit the post in the closing minutes. Cook’s next challenge will be to get his players mentally and physically ready to face a Wimbledon team on Saturday that will be keen to pick up at least a point, being placed just above the relegation zone. Nick Powell was very much missed last night, but rumours suggest he is out for the rest of the season. Cook will have to decide whether to continue with the 34-year-old Roberts in the number 10 position, to bring in Jamie Walker, or change his tactical formation. I have not seen a Wigan win in my two recent visits to Bristol. Perhaps at the more luxurious Ashton Gate next season? Meanwhile Rovers’ Jordanian owner Wael Al-Qadi will continue to look at refurbishing the Memorial Stadium as well as building a new training ground at Almondsbury. 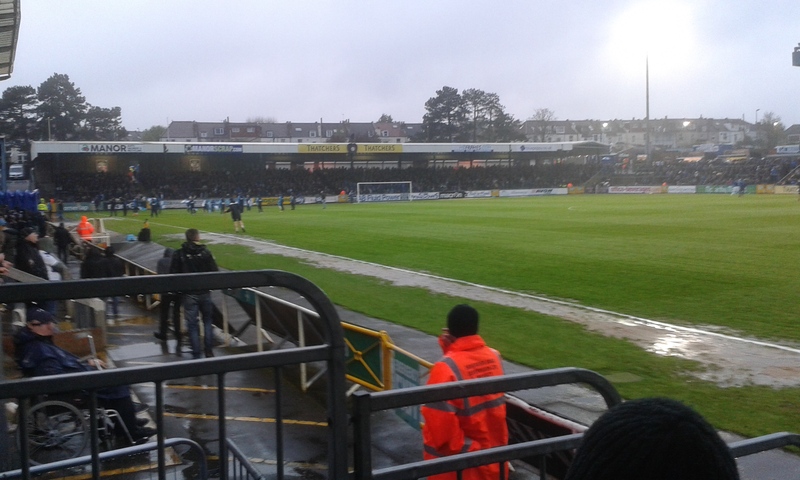 After many years in the doldrums, Bristol Rovers are looking to move ahead. In the meantime, Wigan Athletic fans will have to wait and see whether the club will be taken over by a consortium willing to invest the kind of money needed to survive on a regular basis in the Championship. Should the anticipated takeover by IEG not happen over the coming weeks we can bet that Messrs Sharpe and Jackson will be anxious to secure the continuance of Cook, who has shown before that he can work wonders on a small budget. ← Do we show these teams too much respect?